Hello, and welcome back to my series of articles about the Bardic Arts in the SCA! Often in these articles, I’ve made reference to whether something “sounds” period or not. The primary quality that signals a piece’s authenticity to our ears is almost always the mode in which the piece is set. The vast majority of “modern” music, even music written in a generic minor key, SCA-folksy style, is said not to sound quite right because it’s set in the modes that have become standard format in music from about the post-Baroque era. Disclaimer: I am not a musicologist, and I have only taken a handful of music theory lessons. I’m not academically trained in the area of early music, so what you’re getting here is very much a layman’s explanation of modes. However, I have found that it’s something very few people do know, so I wanted to touch on it before moving on to other, less technical, topics. Undoubtedly there are musicians in the SCA who know far more about this than I, and are better qualified to discuss it! So, this article will only scratch the very surface of understanding what a mode is and what it does to the sound of the music that we hear. I’m also going to grossly over-simplify it, mainly for the purpose of keeping this article short (or as short as possible, anyway). I strongly encourage anyone interested in this topic to take a class from a qualified teacher. Nonetheless, this is probably the most “technical” of all these articles, so bear with it. I promise it’ll pay off later. Another thing to remember throughout this article is that the modes discussed here are those found in the Western European Church and to some extent in the courts of Western Europe. They are perhaps familiarly referred to as Gregorian modes, because they are the rules that grew up to govern Gregorian chant and plainsong. Plainchant is the all-inclusive proper term for the music that encompasses these rules. 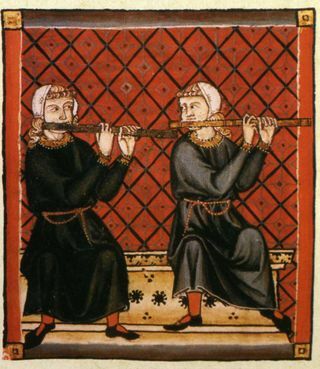 Other cultures and locations saw very different development of melodic construction, so their chord structures and modalities accordingly fall outside the rules and strictures of what we loosely think of as “Medieval” music modes. If we wanted to keep all the notes on the white keys, we could simply move the starting note up 6 or down 2, and we’d have an identical set of intervals. You can also move either of these scales up and down in pitch by simply changing the note where you start and finish, and adjusting all the other intervals accordingly. As long as you keep the same relative distance between notes, you will “hear” the same scale. All you’re doing is changing the key to correspond to your starting and ending note (the “tonic” part of diatonic). With me so far? Great! Now, forget all that. Because the church in the Medieval period didn’t use Major and Minor keys. And they (generally) didn’t use “black keys” to fill in the gaps between the white ones, a.k.a., those other five missing half-tones from our chromatic scale. The interval between an E and an F was always a half-tone, and the interval between an A and a B was always a full step. But, they DID move the starting note up and down to create different key signatures. And that’s how we get Gregorian modes. Clear as mud? Correct! The Lydian, also known as Ionian, mode, starting on F (MP3: Lydian https://aethelmearcgazette.files.wordpress.com/2015/10/07-lydian-scale.mp3). These four modes (Dorian, Phrygian, Lydian, and Mixolydian), are collectively called the “Authentic” modes. Why Authentic? Because they came first. No, really. There are four others that make up the “Plagal modes,” each of which adds the prefix “Hypo” to the names of the authentic mode (Hypodorian, Hypophrygian, etc.). The “hypo” part signifies that each of these modes starts one fourth (i.e., three intervals) below the tonic (or “final”) of the authentic mode it follows, and ends on the fifth above the final. In other words, Hypodorian starts on A, but on a piano keyboard, it would be the A below the D of our Dorian scale; Hypophrygian starts on B, Hypolydian starts on C, and Hypomixolydian starts on D.
So if you’ve been paying attention, you’ll realize that Hypolydian, starting on C and ending on C, is basically a Major scale! Ha, fooled you! It’s not, exactly, because the “final” note (that is, the note on which a chant will resolve, or end), is not C, but F. Nonetheless, for all practical purposes it is basically a Major scale. Well spotted. But wait! you cry. If Hypomixolydian starts on D, and Dorian starts on D, aren’t they the same? Well, yes and no. To start, sometimes the B is flatted (lowered) in Dorian, Lydian, Hypodorian, and Hypolydian modes (to avoid a “clash” between B♮and B♭). Also, the position of the tonic (final) note is different between the two scales. In Dorian, it’s a D. In Hypomixolydian, it’s G. You don’t have to worry too much about all that — and if you’re really intrigued, again, I recommend taking some formal theory classes to help understand it all. The important thing to take away is that this was the methodology used by clerics for hundreds of years to compose liturgical music. As the four, then eight, and eventually twelve modes of chant evolved, they influenced other Medieval and Renaissance music produced by court composers. The influence of these modes is a large factor in why the music of that era has a particular sound, distinguishing it from more modern pieces. But I want to stress again here that this is only the case in most of western Europe, in areas where the Church held a great deal of influence. In fact, Early Music scholars sometimes call it “Frankish” or “Carolingian” chant to try to allow for all the other varieties of chant that were evolving during this time. And in other areas, Eastern European, Chinese, Japanese, Middle Eastern, Sephardic, Ladino, African, and Native American musical structure were not nearly as influenced by the Gregorian modes for most of period, to name just a few. So they are often markedly different from this Gothic European sound. Another big factor to remember is that the secular music that followed these rules was basically limited to the music of the high court, composed by learned scholars who had likely been educated by monks or nuns in the proper composition of music using these modes. The Church, and the Courts with their wealthy patrons, had the resources and the power to see to it that these pieces were preserved. They sponsored the compliation of books that collected music in written notation. That is why a preponderance of extant music from the Middle Ages and Renaissance employs these sounds: The music of the court and the church, is, quite simply, what survived intact. As to what might or might not have survived outside of liturgical and court music, and what rules people used to guide composition–well, that’s for another article! If you’re still having trouble, think how one might use ROT13 to encrypt a statement like a spoiler on a website. You’re using all the letters in order, but offsetting where you start. So A corresponds to N, B to O, C to P, and so on. It’s the same with the notes on the scale – you can shift the relative starting point and maintain the same spaces in between the notes. The difference is that for modes, you’re not adjusting the intervals for the two places where the relative pitch is not a perfect step up or down. Get it? Except for when it wasn’t. But let’s not get ahead of ourselves. See note #2 — here’s where it catches up with us! Though they do appear in secular music all the way up to the modern era. See here for some examples. I’m really sorry about the awful quality of the MP3s. For some reason the only thing I had that I could record them with did not cut off the notes as I went up the scales. They’re pretty much unusable. Sorry! and scroll to the bottom of the page, there are links to EVERY ONE of the scales listed in this article! Use those.